Today, the Delaware State Quarter Coin remembers when the arbitration decision of January 15, 1848 allowed the engineers to resume work on Fort Delaware. Report of the Chief Engineer. Sir: I have the honor to submit the following report of the operations of this department during the past year. For the fiscal year ending June 30, 1848, there was appropriated for fortifications, the sum of $200,000; and for the current fiscal year, ending June 30, 1849, the sum of $515,000. This last amount did not become applicable until about the beginning of August; so that, for many months preceding, the means of the department were small, and the progress of the fortifications under construction or repair, correspondingly slow. I am enabled to state confidently, however, that all things have been conducted ably and faithfully by the officers and agents; and that in adding to the efficiency and strength of the defenses, they have, severally, made the most of their means. The retardation of the system of defense, consequent upon the great drafts made on the treasury for the prosecution of the war with Mexico, gives increased emphasis to considerations which I have heretofore felt it my duty to offer, in explaining the state of fortifications, and particularly the weakness and exposure of some points of great importance. The estimates for fortifications for the coming year has been reduced, under instructions, to the gross sum of $665,000, being $850,000, below the sum of the estimates of the several engineer officers in charge, whose calculations, respectively, were based on that plan of operations that was thought by them to be most advantageous to the public interest; a plan that would in the end be, no doubt, most economical also. At certain exposed points on the coast, new fortifications should be begun without further delay. They have been heretofore recommended by committees of Congress, as well as by this office; and it is earnestly hoped the approaching session will afford the requisite grants. They are mentioned in the following specification of positions and works. A small sum is asked to cover contingent expenses of a joint commission of naval and engineer officers, destined to examine the coast of the United States on the Pacific, with a view to defense the establishment of naval depots, &c.
The title to the Pea Patch island, reported in my last annual report to be under discussion before an arbitrator, selected by common consent of all parties, was determined by decision of said arbitrator, under date of January 15, 1848, to be in the United States. Instructions were immediately issued to an officer of engineers, to whom had previously been committed, in anticipation, the charge of the work, to take at once the necessary steps for a resumption of the construction of the fort. A considerable amount of materials, machinery, &c, had been collected for the work, in operations prior to 1838, but from the long interval that had elapsed, it was found that a very large proportion had undergone great deterioration, amounting, sometimes, to entire decay. Still there was a considerable amount of indestructible material that would be of avail in the resumption. By the terms of the law, the $20,000 appropriated in May, 1844, became available as soon as the title was determined to be in the United States, and Congress, by the act of July 20, 1848, appropriated $50,000 additional. The foundation of this fort is to rest on an extensive system of piling, and, after securing the island, so long neglected, from overflow by the tides, and wash by the waves, and looking to its drainage, the whole of the available means will be devoted to this piling. With this view the wharves have been repaired, the dyke around the island increased by the addition of some 8,000 cubic yards of earth, the quarters for laborers repaired, old machinery put in order, and new purchased; the ditches of the work, nearly filled with the sediment of years, cleared out, and contracts made for the delivery of stone intended for the dyke, and piles for the foundation. The driving, of the piles will, it is hoped, commence before the middle of November, and be continued, as the weather permits and available means allow. These means will not, however, provide for the piling for all the foundation, even of the main work. The total balance will be expended by the 30th June, 1849, and the officer in charge requests, for the next fiscal year, $150,000; of which sum, after completing the piling and the grillage of the main work, $75,000 is designed for the superstructure. There can be no doubt of the propriety and economy of such an appropriation, but the large demands on the treasury for other operations make it necessary greatly to reduce this amount. Balance in the treasury on the 30th September, 1848—$46,200. Probable amount to be expended by 30th June, 1849—$46,200. Estimate of amount required to be appropriated for fiscal year ending 30th June, 1850—$50,000. 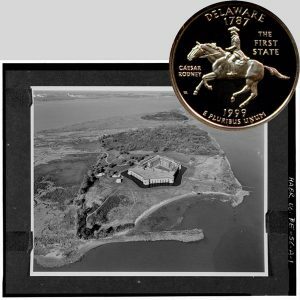 The Delaware State Quarter Coin shows with an historic building survey image of the fort from the mid twentieth century.